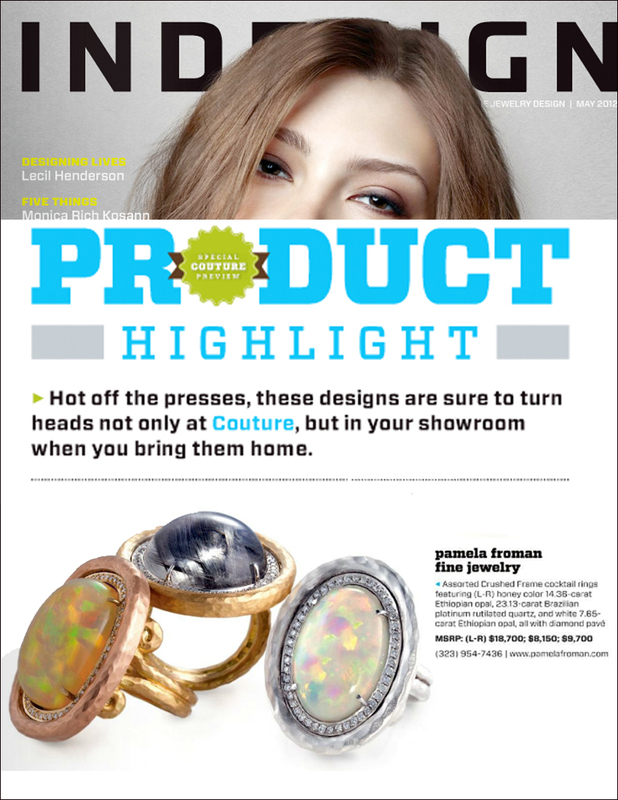 Couture sends out a monthly newsletter and they feature one designer, one store and then write about what is new leading up to Couture. Very flattered to be chosen to be written about the month before Couture 2012! 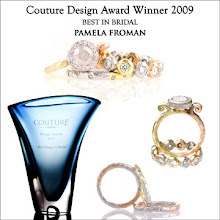 Born and raised in Manhattan, fine jewelry designer Pamela Froman began her career working for couturier brands before breaking out on her own. Now six years into her endeavor, Froman has built a brand that offers bright, feminine pieces through a unique technique that renders a distinctive look. Here, the designer shares her approach to gemstones, the wearability factor of her jewelry and how architecture influences her work. National Jeweler: Can you tell us about the Pamela Froman brand? Where and when were you established? Pamela Froman: The beginning of my career was spent designing various collections for couturier brands like Courregès, Valentino and Guy Larouche. As much as I enjoyed the challenge of creating for renowned designers, I needed to forge my own artistic path. 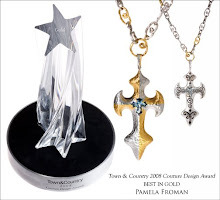 I began creating pieces on the side for myself, and Pamela Froman Fine Jewelry was officially launched in 2006. Everything is designed and created in Los Angeles, and I feel very strongly about that; making my collection in the United States, not outsourcing overseas. NJ: What metals and stones do you primarily work in, and why? PF: I work primarily in 18-karat gold, and I feel that’s what I’m most known for, my use of multiple colors of 18-karat gold in one piece and the special colors I’ve developed. By “special colors,” I mean my 18-karat yellow gold, which is warmer than most yellows it distinguish it from the 18-karat green gold I use, and my 18-karat pink gold, which is peachier to look good on most skin tones. Also, I love irregular surfaces, so most of my collection is textured with a special technique I call “crushed”--I use too many tools to simply call it hammered. Combined with a satin finish, this crushed texture gives a much softer, more natural feel to the metal. 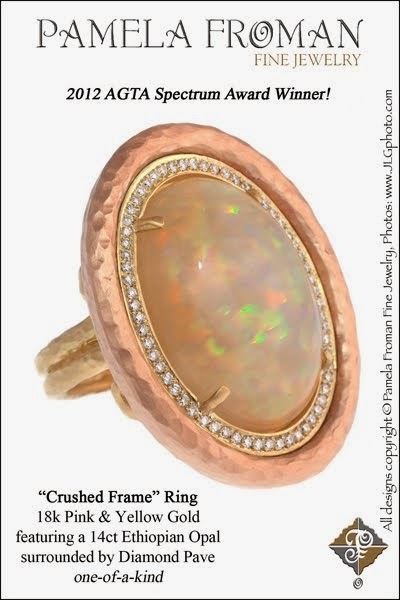 When it comes to gemstones, I believe “semi-precious” is a misnomer; all natural gemstones are precious to me. I especially love stones with irregularities that make them unique works of art, like rutilated quartz, labradorite, rainbow moonstone, opal and tourmaline. I also love working with “rough” or “rustic” diamonds for the same reason; they’re so unique! However, the colorless diamonds I use are held to a higher standard--they’re all brilliant-cut, F-G color, VS quality or better, so even the smallest diamonds have fabulous sparkle. 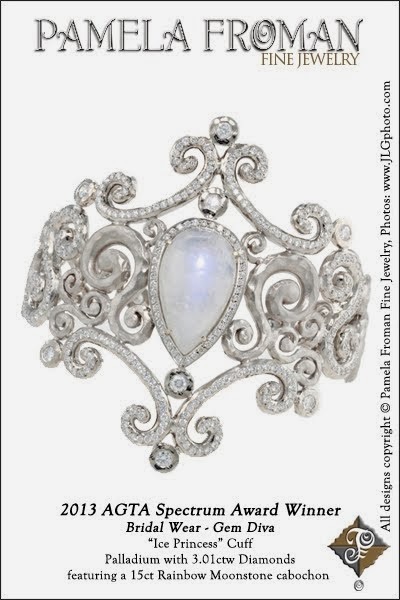 NJ: What is new at Pamela Froman in terms of design? PF: I design a lot of one-of-a-kinds. So there’s always something new! For instance, I discovered gorgeous matrix Paraiba tourmaline in Tucson that I am currently designing a collection around for Couture. I’m making more fabulous one-of-a-kind cocktail rings for my self-purchasing customer, and I’m adding more unique pieces to my platinum rutile collection as well. I’m also expanding my popular “Ombre Crush” Collection, a combination of 18-karat pink and yellow gold, with new designs which are repeatable pieces, but still unique because they’re handmade. NJ: What serves as your inspiration? PF: I know everyone says this, but architecture has inspired a lot of my designs. More specifically, old-world European architecture, especially scroll-y wrought iron gates, and the beautiful domes of St. Petersburg. One of my favorite design elements is the scroll, as you can see in my collections. It’s a very organic, feminine shape, and I love the way it flows. I also find inspiration in fabrics and textures, and often the gemstones I choose influence the design. NJ: What is unique about your design? 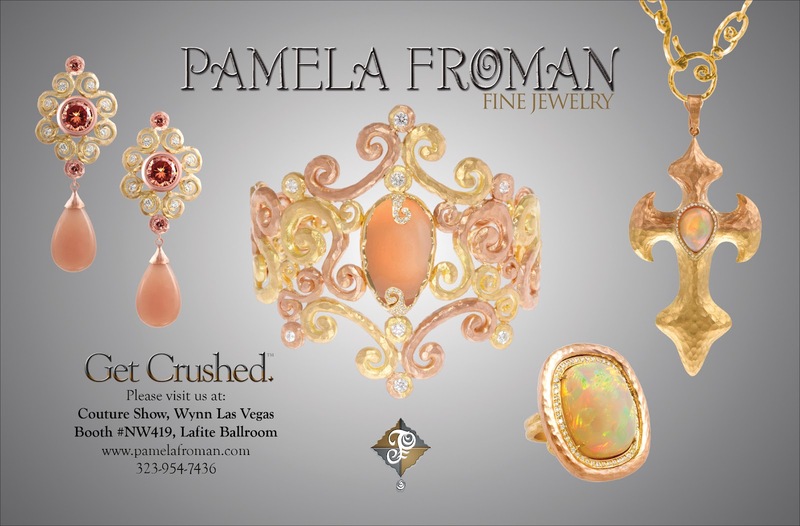 What sets Pamela Froman jewelry apart from other fine brands? PF: I think that my special gold colors, and the way I mix them together in one piece, are what really distinguish my brand. Also, I design with wearability in mind. My “crushed” texture and satin finish paired with high-quality diamonds lends an understated glamour to the pieces that make them incredibly wearable. They can just as easily accessorize a pair of jeans as they can an evening gown. 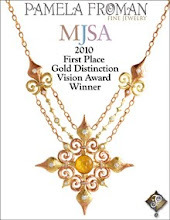 NJ: What do you like best about being part of the fine jewelry industry? PF: I love the camaraderie of the industry. 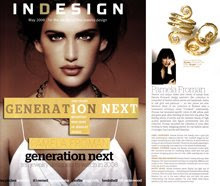 The people in it are really wonderful and passionate about the art of jewelry, and that is very inspiring. NJ: Who are you designing for? 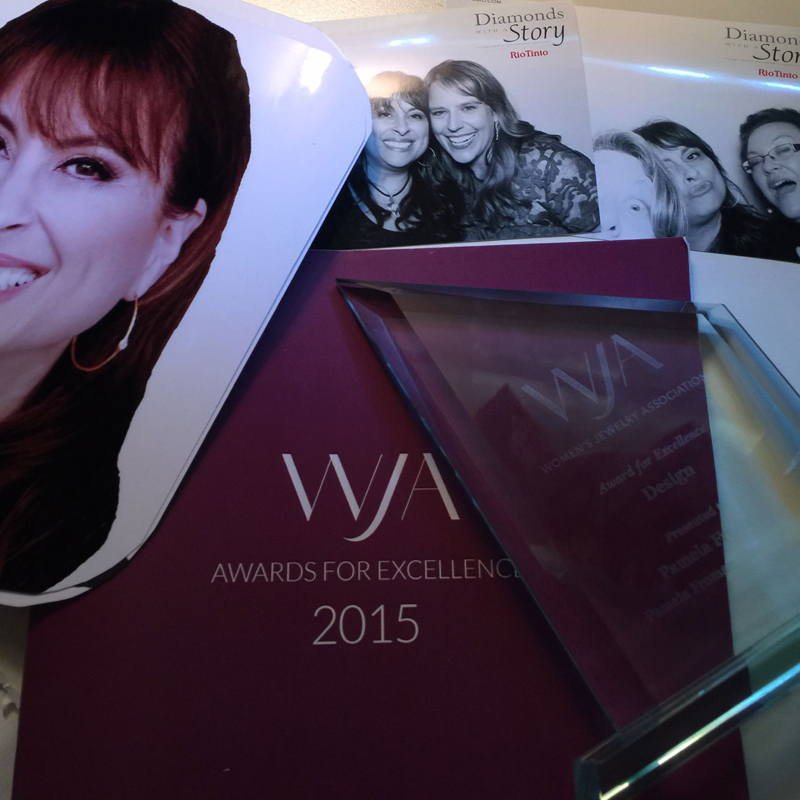 Who is the Pamela Froman customer? PF: My customer is a confident woman with a strong sense of her own personal style, regardless of her age. 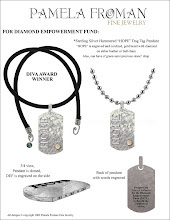 She wants to be seen as a unique individual, and her choice of jewelry reflects that desire. In short: if everyone’s wearing it, she’s not interested. Who “crushes” (a technique all her own) precious metals in rich colorations and makes exquisite fine jewelry that is unique, rich in quality and very hip, in a non-traditional kind of way?! The answer is fine jewelry designer Pamela Froman, native New Yorker, current Californian, who recently brought her bag of jewels to Cotton Club Collection from her studio in Santa Monica. Pamela, a regular visitor to Cotton Club, arrives there once each season, usually around Mother’s Day and in Fall for the Holidays, has a devoted following here that purchase regularly from the inventory that Lisa Spain carries in her boutique. 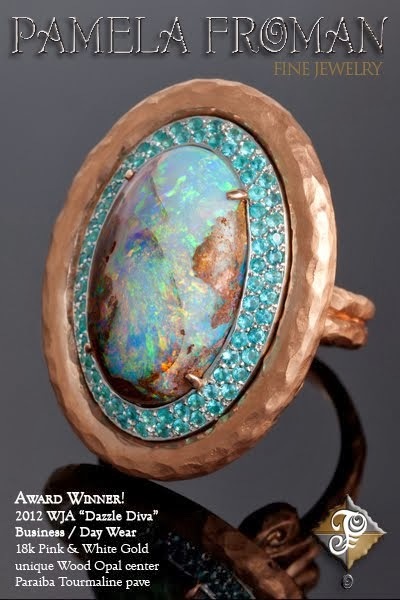 However, they love to visit with Pamela and to purchase from her expanded collection that features handmade pieces most memorable for her use of multi-colored precious metals and exquisite, rare natural stones. Pamela, a graduate of F.I.T., began her career in Paris, where she designed jewelry for many of the top couturiers including Courreges, Valentino and others. 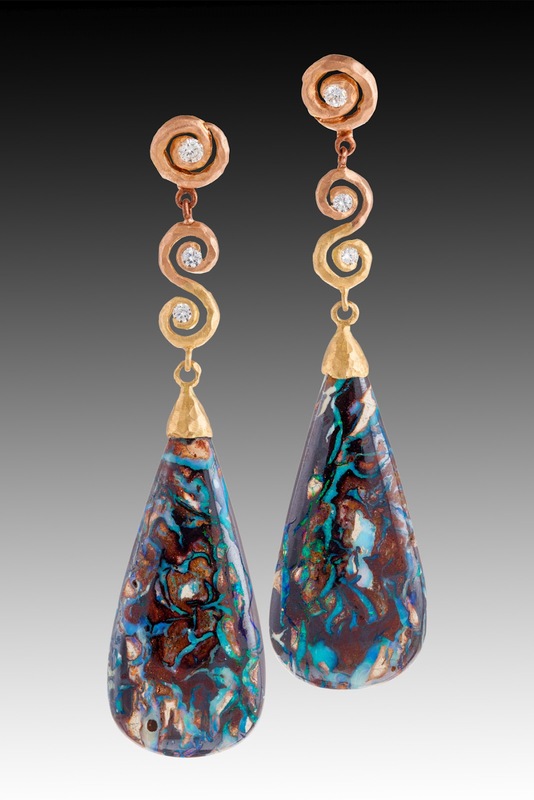 In 2006, she decided to branch out on her own and began by making her signature a reflection of her love for “irregular surfaces.” The designer explained, “So much of my collection is textured with a special hand-hammering technique I call ‘Crushed.’ Done in a variety of the highest quality colored metals (22K, platinum and 18K) with precious stones and you have a look like no others that I have seen. Pamela believes that “individuality is the underlying theme of beauty” and that she delivers. As all pieces are handmade in L.A., no two pieces are exactly alike. For creating this technique she has won many awards in the industry, the respect and attention of all the fashion magazines and is a celebrity favorite. 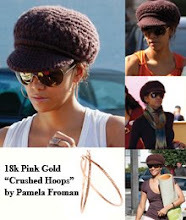 You will see her popular hoops photoed on the likes of Halle Berry, as well as other celebs such as Diane Lane, Debra Messing, Eva Mendes, Tyra Banks and Rachel Ray that are regular followers that have shown that they have a “crush” on Pamela Froman’s unique styles as will you when you see them. The following are a sampling of the many styles Pamela has to offer at Cotton Club…. 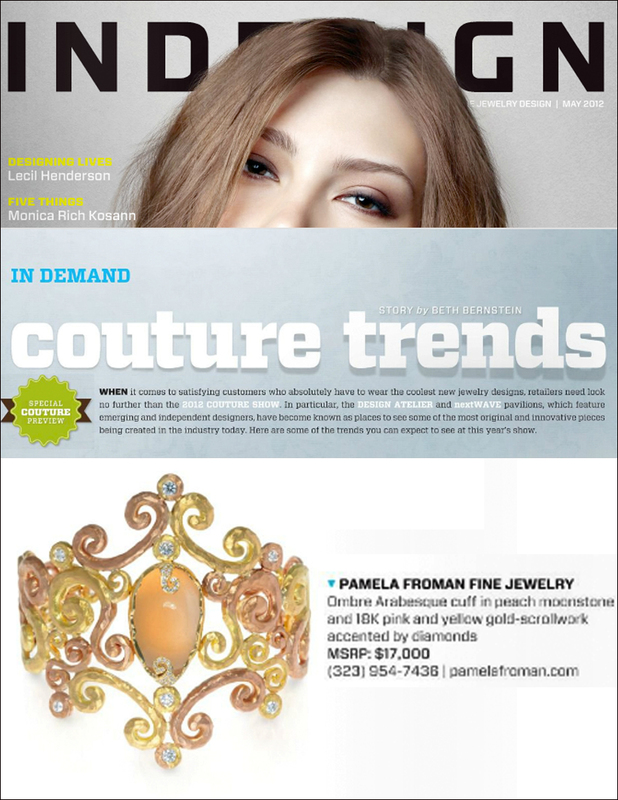 To see more of Pamela’s fabulous styles, visit www.pamelafroman.com. Australian Yowah Boulder Opal briolettes! Hey, and this is one of my "Mommy" earrings, which means the bottom slides off and you can wear just the 18k Pink diamond stud by itself. Though I am not sure you would want to be seen without those spectacular drops! Just Yummy!